This paper compares the patterns of socio-spatial peri-urban change in two post-socialist state capitals: Havana, Cuba (2.1 million) and Sofia, Bulgaria (1.3 million). At the outset, we are aware of the conceptual “error” in using “post-socialist,” but we make the following observations. Although a private real-estate market does not exist in Havana, there has been a significant opening of commercial joint-venture and limited private-sector (e.g., foreign owned) construction since the mid-1990s. While it would be inaccurate to assume that Cuba is launched on a predetermined, mechanistic course moving from a centrally- planned to unfettered private market economy, we wish to consider what a future scenario in Havana might look like given what the eastern European experience has been in general, and what Sofia offers in particular.2 Both Cuba and Bulgaria were, until 1990, orthodox socialist states with severe restrictions on private property and real estate development, where virtually all housing was sponsored by the state. However, today the two countries have embarked upon very different economic and political roads. Specifically, whereas Cuba is a semi-socialist state, in which private development occurs only through state partnership with foreign capital, Bulgaria has fully embraced free-market, quasi-regulated capitalism. Thus, while the two countries in essence started from a similar point in the 1990s, today they operate under different principles. The comparison between patterns of post-socialist peri-urban change in Havana and Sofia is instructive because it illustrates precisely how spatial patterns reflect social changes. In 1990, both capital cities started from similar “baselines”—both had relatively sharp urban edges, framed by greenbelts and agricultural fields, and were surrounded by relatively poor villages. 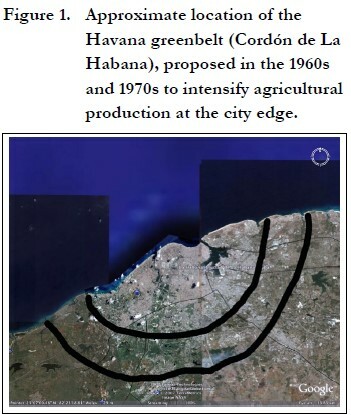 Although the Cuban socialist government’s efforts to build a greenbelt (Cordón de La Habana) around the city in the late 1960s failed, there has been relatively little new construction around the beltway (anillo) that surrounds the city (Figure 1). In other words, neither Havana’s nor Sofia’s peripheries had much in common with the most common capitalist, Western-style pattern of peri-urban development—upscale suburbia. Since 1990, however, Sofia has slowly built the type of suburbia common in Western cities. 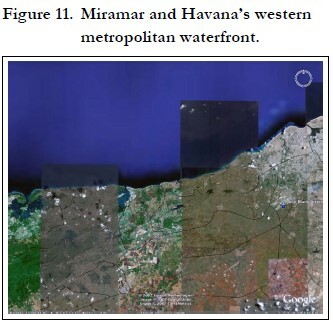 In contrast, Havana has limited new construction to major revitalization efforts in the UNESCO World Heritage Sites of Habana Vieja and opened up new commercial enclaves in the Barlovento district of Miramar (Scarpaci et al. 2002; Figures 2–5). In this paper, we first outline the global diversity in peri-urban development patterns, and contrast those in socialist and capitalist cities as described by the literature. Then, we discuss the typical pattern of postsocialist peri-urban development, also according to the literature. Third, we summarize empirical findings for the development of Sofia’s periphery since 1990. Fourth, we present the current state of Havana’s outskirts. In conclusion, we reflect upon the likelihood of Havana following Sofia’s post-socialist peri-urban model, if Cuba is to eventually enter the capitalist realm. There is considerable geographic variation in the peri-urban development patterns (Browder, Bohland and Scarpaci 1995). Most striking are patterns akin to developed (Western) and developing (non-Western) capitalist contexts. Generally, the pattern of peri-urban growth in the developed capitalist countries is confined to upper- and middle-class suburbanization, both until the mid-twentieth century (Fielding 1989) and before (Fishman 1987). In the developing realm, the dominant trends are rural-to-urban migration (relocation of poor residents from rural areas to towns and cities) as well as stepwise migration (relocation of the poor from small towns to major cities).3 Following Korcelli (1990), we refer to both terms as rural urbanization. Three defining attributes distinguish suburbanization from rural urbanization: (1) demographic; (2) motivational; and (3) functional (i.e., how are the peri-urban forms related to the urban core). In demographic terms, suburbanization is the outflow of upper-class residents from an urban center towards the city edge (Jackson 1985). This contrasts with the rural urbanization common in developing countries, a process that entails the movement of poor provincial dwellers—frequently displaced because of agricultural mechanization changes in export crops or landholding sizes—to the periphery of large, economically diverse cities (Knox and McCarthy 2005, Bromley and Bromley 1982). In Latin America, the migration pattern is often stair-step migration: from small town, to provincial, then to capital city, or else from rural village to capital (primate) city. This Latin American process frequently entails the migrant first arriving at a downtown tenement house (often called “disguised poverty” (la pobreza disfrazada because of its location behind walls or in once-prestigious structures whose facades appear to be in good condition) (Ford and Griffin, 1980; Elbow 1982; Thomas and Hunter 1980). Thus, whereas Western peri-urban fringes mostly entail affluent suburbanizers, non-Western ones include the poor who reside in neighborhoods referred to as “slums of despair” (Stokes 1962). Western suburbanites are motivated by a desire to escape urban disamenities and secure a higher quality of life and a “familyfriendly” way of life in leafier, private and exclusive locales (Vartianen 1989, Fishman 1987). This differs from the provincial migrants who seek work in the large city. They use the urban fringe as a “stepping stone” in gaining permanent residence. Finally, Western suburbs consist of residential commuter zones that rely on the city center for employment and services (Fishman 1987, Muller 1981).4 This makes them distinct from non-Western urban edges that have shown a more complex economic tie to the city and who rely somewhat on agriculture and their links to the countryside (e.g., Dias 1990). Neither of these processes unfolded in their pure form under socialism. To be sure, substantial peri-urban growth took place, but this resulted from high fertility and low mortality rates in cities as well as rural urbanization (Korcelli 1990). Unlike developing nations, socialist-type rural urbanization was allowed by the central government and was directed toward state-built housing districts. These areas, in turn, were also the homes of a socialist “middle class.” Accordingly, they cannot be classified as the “slums of despair” typical of developing nations. The rubric “Western-style suburbs” is also unpersuasive because the socialist zones were neither the product of urban outflow, nor the result of residential choices made by upper-strata households (Berhnardt 2005, Tammaru 2001). There are two other sub-types for the category “socialist suburbs”: the coveted areas of summer cottages (e.g., the Russian dachas and the Bulgarian villas), and the villages surrounding large cities. Nevertheless, they also fail to capture the classic suburban prototype. The dacha/villa zones attracted the socialist elites, but they were not neighborhoods of permanent living and did not cause city-center depopulation. Villages were only somewhat dependent on the city for employment, did not entail daily commuting, were not wealthy, and also did not lead to urban outflow (Kok and Kovacs 1999, Ladanyi and Szelenyi 1998). Arguably, some peri-urban settlements served as stepping stones for rural migrants who were unable—either for economic or administrative reasons—to gain full urban residence (e.g., Ioffe and Nefedova 1999 on Russia). As Eastern Europe entered global capitalism, it is reasonable to hypothesize that post-socialist cities were experiencing a transition from socialist to capitalist spatial structure (Haussermann 1996, Sykora 1994). Since post-socialism is an evolution toward advanced (versus Third-World-type) capitalism, post-socialist cities might logically be developing the suburbs representative of Western cities. This hypothesis is plausible since many of the prerequisites of Western-type suburbanization (Fielding 1989, Fishman 1987, van den Berg 1982), appear to have developed after 1989 in Eastern Europe (Sykora 2001, 2000; Kok and Kovacs 1999). These preconditions are the availability of private land at the city edge; the creation of a private, profit-seeking real estate market; widening social stratification; and greater ownership of private automobiles (e.g., Tosics 2004). Simultaneously, though, other key preconditions are absent. Specifically, suburbanization is affiliated with an increase in wealth and with concomitant public investments in the peri-urban infrastructure (e.g., roads and sewers). However, the post-socialist transition has not facilitated suburbanization in this respect. For example, the half decade following the 1989 demise of the socialist camp triggered considerable economic decline, unemployment, a drop in living standards, and the thinnest of public investments (Andrusz 1996). Only in 2000 did the Eastern European levels attain the 1989 mark. Moreover, the Balkan economic recovery did not even start before the late 1990s. In these austere settings, a different type of peri-urban development may develop. Rather than suburbanization (i.e., where affluent households leave the city in pursuit of a higher quality of life), a process of de-urbanization—or what we call urban ruralization —may ensue. This phase is part of a set of “survival strategies” of the poor (Smith 2000), who migrate from cities to peri-urban places so they can access rural plots of land and grow their own food (Clarke et al. 2000, Seeth et al. 1998 on the Russian “food jars” or “garden plot” economy). Such de-urbanization has been documented even in the relatively well-off East European countries such as Hungary in the 1990s (Ladanyi and Szelenyi 1998, Szelenyi 1996). Under this logic, the geographic edge of the most vibrant cities, particularly national capitals, will attract migrants from lower-income areas. If so, this is the same mechanism of rural urbanization that prevails in developing countries. For Sofia, such in-migration appears in government statistics (Stolichna Obstina 2003), 6 although the data do not show exactly in which district of Sofia—on the fringe or not—the provincial migrants relocate. Summing up, then, we conceptualize at least three viable scenarios of post-socialist peri-urban growth: (1) Western-type suburbanization; (2) urban ruralization as a “household survival strategy”; and (3) rural urbanization commonly found in developing nations. These three scenarios are not mutually exclusive but do manifest social composition, place of origin, place of employment, and motivations of the actors who are leading the process. Such scenarios inherently carry different social needs and the planning strategies required to address them. Identifying which of these processes is dominant offers theoretical insight because it begs the question: “What is post-socialism?” Many analysts in the 1990s contended that post-socialism was not evolutionary (i.e., moving unilinearly toward advanced capitalism) but, rather, was involuntary and path-dependent. Put another way, this means either reverting to the presocialist (early capitalist phase), or repeating and even exaggerating aspects of the socialist past (Burawoy 1997). Still, other scholars, such as Stark (1996), claimed that post-socialism is a “recombination” of socialist and capitalist elements. If post-socialist periurban patterns look like those in developing countries and/or further processes that happened before or during socialism, the involutionary theory may find support (Ladanyi and Szelenyi 1998). Another scenario is that if the post-socialist urban fringe is a mixture of Western-style suburbia and socialist-type rural settings. If so, Stark’s conceptualization of a “recombinant” post-socialism would garner support. Lastly, if Western-style suburbanization is the dominant trend, this supports the argument that post-socialism marks a transition to Western-type capitalism. Sofia’s spatial form notably evolved during the socialist and the post-socialist periods. Peri-urban Sofia expanded during both eras, but in very different ways. During socialism, Sofia grew after the adoption of industrialized construction methods, which occurred in the 1960s. Following leading Soviet examples, Sofia annexed large territories comprising farms and fields to the north and south of the city. Upon those “vacant” lands, the authorities built large new housing estates. Thus, between 1963 and the end of socialism in 1989, Sofia’s borders increased from 42 to 190 sq. km. In the same period, population grew from 400,000 to 1,120,000 persons (Hirt 2006). After socialism, Sofia’s periphery underwent a different type of spatial transformation. Right beyond the socialist urban edge and around some former villages8 on the south side of the city, Sofia has developed a lower-density, suburban-type residential periphery. In essence, one may say that the city and the country have started to “crawl” toward each other (Hirt and Kovachev 2006). The farm belt9 between them is slowly vanishing and the once-sharp urban edge is gradually becoming blurred (Figures 6 and 7). Evidence of such sprawling development can be found in municipal statistics. Sofia’s population has declined by 1 percent from 1992 to 2001. Yet, 5 out of its 24 administrative districts have experienced double- digit percentage growth (Nacionalen Statisticheski Institut 2001a, 1993a). Four of those—Vitosha, Ovcha Kupel, Vrabnitsa and Bankya—are large, once-rural peripheral districts.10 In terms of housing units, the largest growth has also occurred in the same peri-urban, once-rural areas (Hirt 2006). The new growth in Sofia’s periphery is of much lower density. In the built-out areas of Vitosha or Bankya, density is only about 25 persons per hectare. This compares to 400 in the large socialist estates. And, whereas the majority of dwelling units in the socialist areas are located in large residential towers, new residential development in peri-urban Sofia comprises mostly single or two-family homes (Figure 8a). For instance, in the socialist district of Mladost, the average number of dwelling units per building constructed in the 1980s is nearly 50; but in Vitosha, the average number of units per building constructed in the 1990s is only 2 (Hirt 2006, Nacionalen Statisticheski Institut 2005). Post-socialist suburbanization has accelerated since the late 1990s. Since then, not only residential but also large commercial uses like warehouses, car repair shops, malls and wholesale trade (many of which are foreign-owned) have spread along or nearby the urban edge (Hirt and Kovachev 2006, Stolichna Obshtina 2003, Staddon and Mollov 2000, Dimov et al. 2000). In 2004, there were already twenty Western hypermarkets in the urban periphery. The social profile of the new residents of Sofia’s periphery is starkly different from that under socialism. A recent survey conducted in the southern peri-urban district of Vitosha, which experienced housing growth of 53% as compared to 12% for all of Sofia’s region, found many important differences between the group of post-socialist “newcomers” and pre-socialist “indigenous” residents (Hirt 2007). Specifically, the newcomers are, predictably, younger but also wealthier. More than 40% of the newcomer households earned monthly incomes greater than 2,000 Bulgarian leva ($1,345); this is nearly four times the national mean (Nacionalen Statisticheski Institut 2007). Only 5% of the long-time residents attained these levels. Just 2% of the newcomer households earned monthly incomes less than 250 leva (which is around half the national average), versus about 40% of long-time residents. The newcomers also have higher educational status. Over half of them have a college degree as compared to a third of the longtime residents, and their homes are decidedly larger and upscale (Figure 8b). Contrasting the previous residences of the two groups reveals substantial differences. In both groups, the largest group of respondents had moved to their present peri-urban home from the City of Sofia. This might indicate that some out-migration from the city had started before 1990. However, those newcomers who migrated from the City of Sofia form the majority: 68%. In contrast, only 34 percent of the long-time residents moved from Sofia, whereas about 30% moved to their current address from a different home in Vitosha, and about 30% resided in the same house their entire lives. This means that urban outflow has increased considerably after the demise of socialism. In both populations, only a few informants had migrated from elsewhere in Bulgaria—8% of the newcomers and 2% of the long-time residents. Accordingly, we conclude that there are scant traces of rural urbanization—at least in this section of peri-urban Sofia—although the process may have recently accelerated. 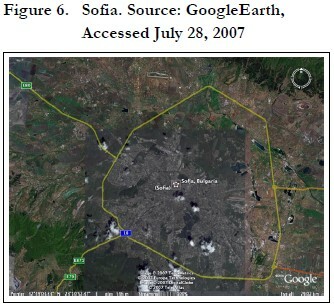 Another marked difference between the newcomers and the long-time residents is the rationale for locating at Sofia’s periphery. Seventy percent of newcomer informants stated that living at the urban fringe is for quality-of-life reasons and their wish to escape urban life. “Sofia is too polluted for normal people to live there,” “Nadejda [one of the socialist housing districts] became too noisy and dirty for my taste,” “I feel free here. Finally, I don’t have annoying neighbors,” “I don’t like city life. It is overcrowded,” “One can’t find privacy in an apartment building, and “Sofia is a madhouse and now I got the opportunity to escape it!” (Hirt 2007). Similar motivations were disclosed by just 34% of the long-time residents. The most common explanation for living where they did, a reason reported by 49%, was a sense of local identity. This sentiment was apparent in responses to the motivational question, such as: “Where else can I go?”; “This is my home”; “I’ve always lived here”; “My family is from here”; and “We are locals” (Hirt 2007). These findings show that the post-1990 residents of Sofia’s peri-urban Vitosha generally adhere to the profile of Western-style suburbanites. Residents are fairly affluent and well educated, and they have left Sofia mostly to escape the disamenities of urban life. Summing up, the main process along Sofia’s southern edge is suburbanization. This finding supports claims that the post-socialist city is transitional and evolutionary (rather than involutionary) because it is acquiring the affluent suburban attributes present in Western capitalist cities (Sykora 2001, 1994). 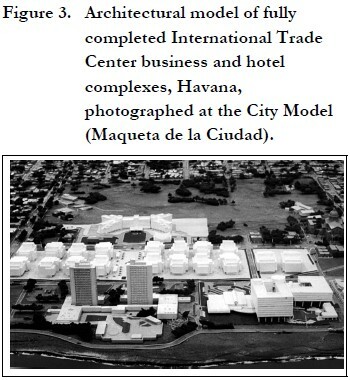 Havana’s urban morphology is uniquely polycentric; that is, there appear to be several key nodes that serve important functions. These nodes include the colonial quarters of Habana Vieja; the Republicandominated Parque Central and Prado along the edge of Habana Vieja; the government-centered Plaza Cívica that dates to the 1950s pre-revolutionary era; and the tourist and cultural enclave of the ‘new city’ located in Vedado’s La Rampa-Coppelia section (Scarpaci et al. 2002). 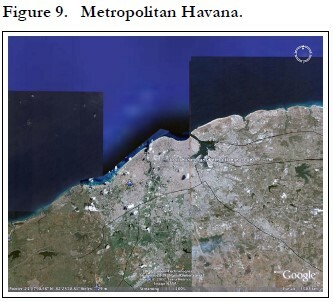 Because of the deteriorated infrastructure in the urban core, we would anticipate new post-socialist construction to take place where—what was a century ago—considered ex-urban towns beyond the city limits, but squarely in what is today Havana Province (Figure 9). We base this forecast on two conditions. First, it assumes there will be a liberalization and market regulation of real estate. Second, it supposes than the need for family gardens, both for partial subsistence and for surplus sales in Havana markets, will continue. This latter assumption derives from the very pressing need for food production, which, since the demise of the USSR, has been perhaps the single largest social problem (Peters 2001; Peters and Scarpaci 1998). The anticipation of new low-density exurban developments would build upon the pre-1959 pattern of urbanization, which encouraged satellite commuterbedroom communities for a growing bourgeoisie. In addition, these new developments will require stable water, sewer, and electrical infrastructure than the fractured built environment of the extant city can barely provide as it is, let alone deliver services to exurban nodes. 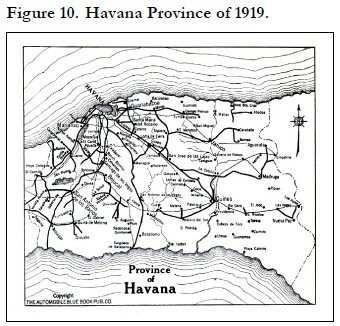 In many ways, the once-peripheral towns surrounding Havana in the early twentieth century may be the new “edge cities” (Garreau 1991) in the twenty-first century (Figure 10). For instance, if more than half of the city’s water is lost through leakage, expanding off that grid will decrease line pressure. As to waste, we envision new codes that mandate new septic tanks or some water-treatment facilities for discharge in the Quibó and Almendares tributaries flowing south to north. In short, this anticipated model of post-socialist growth would not be unlike the Sofia model outlined above, and we envision high-value vegetables and not the low-yielding and largely symbolic organopónicos (organic in-fill gardens within the city proper). We would also anticipate striking income differences to emerge over time; nouveau riche, small farmers, new suburbanites, young Cuban Americans (Yucas), retired (and elderly) Cuban Americans, and apparatchiks from the current Cuban nomenklatura who will wisely cash in on new land opportunities. 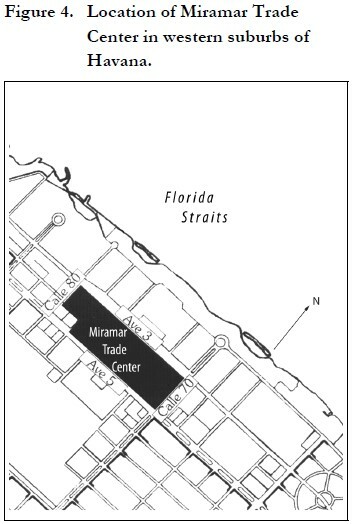 The areas west of Miramar (Figure 11), south towards Rancho Boyeros, Santiago de las Vegas, and the international airport could satisfy these demands, as would lands between Havana Province and Matanzas (Figure 12), which would very likely be enhanced with limited access highway development. By mid-century, we would expect to a gradual infilling of this conurbation between Matanzas and Havana. The comparison of Sofia and Havana is derived from a common urban and political-economic history. Both cities, roughly the same size, are gradually emerging from a centrally-planned economy. Although Sofia has been integrated into a market economy for at least 15 years, Havana too has had some relaxing of the controls on agricultural production, even though private property remains in state hands. 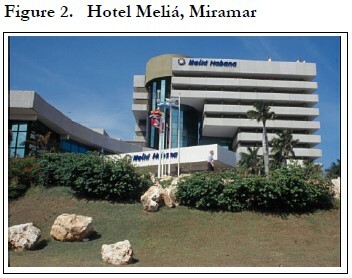 Both Bulgaria and Cuba face difficult economic conditions that may induce an alternative form of periurban development. Rather than a conventional form of suburbanization (i.e., affluent households leave the city’s disamenities in search of a higher quality of life), a process of de-urbanization—or one of urban ruralization—may ensue. Following Smith (2000), we contend that this process is part of a package of “survival strategies” for the poor who migrate from cities to peri-urban edges to use rural plots of land and produce their own vegetables. There is evidence for this in Sofia but it is also apparent in the Russian “food jar” or “garden plot” economies (Clarke et al. 2000, Seeth et al. 1998). This form of de-urbanization has been documented in Hungary (Ladanyi and Szelenyi 1998, Szelenyi 1996), and we believe Cuba’s food crisis, coupled with Havana’s availability of agricultural land, make the Cuban capital a likely candidate for a similar process. At the outset of this essay, we proposed three scenarios of post-socialist peri-urban growth: (1) Westerntype suburbanization; (2) urban ruralization as a “household survival strategy”; and (3) rural urbanization, the latter prevailing in developing nations. We argued that the three are not mutually exclusive but instead manifest attributes of social composition, place of origin, place of work and motivations of the actors who are leading the process. 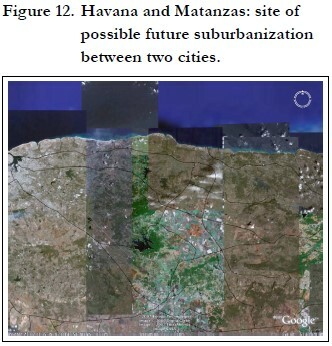 The experiences of Sofia and other cities lead us to conclude that Havana’s future will represent a hybrid combination of the second (rural urbanization/household survival strategy) and first (Western-type suburbanization) scenarios which will co-locate small farmers next to up-scale, larger residential homes. These land-uses will reflect a need for fresh vegetables as well as ‘green sites’ where Havana’s decrepit infrastructure will not hinder new suburbanization. The Russian dacha and Bulgarian villa may turn up in Havana as the guajiro, el nuevo burgués, jubilados, and a new breed of bisneros co-existing at Havana’s periphery. Summing up, then, we argue that new peri-urban development will likely unfold in the Cuban capital for two reasons. First, the current infrastructure of the extant built environment can unlikely support new development until a major reinvestment comes in the water, waste, and related utility infrastructures. Second, the metropolitan fringe, clearly marked by a greenbelt, would allow new exurban (affluent) commuters or retirees to co-exist next to truck and garden farming. That latter would satisfy a growing demand for fresh produce until mass distribution retail grocers, new mechanized farms elsewhere on the island, or until massive importation of foodstuffs arrives from the United States. Given the case of Haiti, Puerto Rico, and the Dominican Republic, it is very likely that container transfer will satisfy the demand for processed foods. Until then, we believe this new exurban pattern of post-socialist development is likely to share many of the recent attributes of Sofia in the eastern European context. 1. We are grateful to helpful comments made by Ted Henken on an earlier version of this paper. 2. 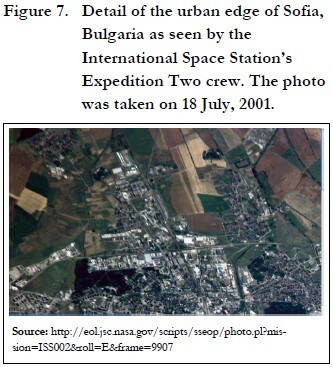 The findings on Sofia are based on Hirt (2006 and 2007). 3. Of course, rural urbanization occurred in Western contexts too but typically at an earlier stage of history. 4. Through the 20th century, suburbs in the United States and to a lesser extent Western Europe have become increasingly independent from the urban core and eventually acquire the status of “edge cities” (Garreau 1991). At this point, however, they no longer fit the category of “suburbs” (Fishman 1987). 5. In the 1990s, Sofia attracted 50% of foreign direct investment in the country. Sofia’s unemployment rate remained in the single digits even when national figures approached 20% (Stolichna Obstina 2003). 6. Because of in-migration, Sofia’s population has declined by 1%, while the nation’s has shrunk by 15%. 7. According to official data, Sofia has a population density of 57.5 persons per ha (Stolichna Obshtina 2003), as compared to 53.1 persons per ha in Stockholm, 48.8 in Amsterdam, 46.6 in Paris, 42.3 in London, 28.6 in Copenhagen, 16.6 in Chicago and 12 in Boston, for example (Kenworthy and Laube 1999). In Sofia, the density of built-up areas averages 105 persons per ha (Buckley and Tsenkova 2001: 16). 8. During socialism, most such villages were designated as “villa-zones,” or areas for summer villas. 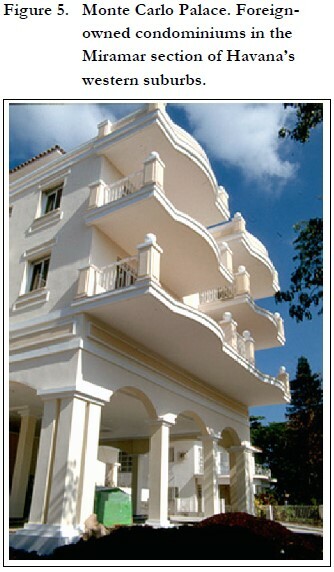 Some communist officials indeed built villas there. However, most permanent inhabitants were farmers of modest means. After 1989, the villa-zones attracted permanent upper-class residents, who commute to the city. In essence, the villa-zones are now becoming residential suburbs. The process has been enabled by the fast growth of cars: from 250,000 in 1989 to 800,000 in 2005. Sofia is now fourth among European capitals in cars per person! In the mean time, public investment in mass transit has been inadequate (Stanilov 2005). 9. Although socialist Sofia did not formally have the kind of greenbelt that exists around English cities, zoning of the farm areas around it banned development. Thus, the effect was similar to that of greenbelts. 10. Growth in the fifth one, Poduyane, which is more centrally located, has been registered only because its borders were recently expanded to include parts of other, neighboring districts (Stolichna Obshtina 2003).